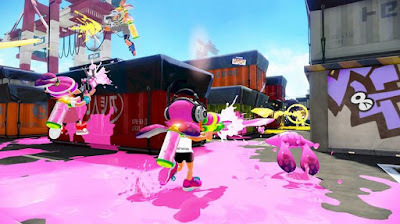 This guide contains tips and tricks, as well as explanations of Inkopolis, the different weapons and their own managed (Pros and Cons)! With regard to strategy tips to individual weapons, so these tips are only a little help, since you depending on secondary and special weapon again may proceed very differently. Besides these, each player must decide on what equipment he uses and with what weapon he achieved as most, so you can no more go into detail in the above strategies (We hope you understand)! For all 3 shops applies only one rule, you have to be cool enough that just means the need to raise their level to your purchase (at least Level 4) to you something! Once you reach Level 4 or higher, you can look around in the shops by an equipment for the online mode. If you're wondering what it brings you (other than looking a little cooler), it brings you capability. That your tank fills quickly or you have more speed for 30 seconds! But if that were all, a capacity per equipment, would be all to the quick boring with max. 3 skills! That's why you can buy equipments that. In addition to a basic capability for up to max Can have 3 more skills. 1) The range of equipment stores changes daily, but is part of your level dependent (you have a higher level is likely to more stars later)! 2.) What is special about the additional skills that you unlock it just through the online mode. You gain in online fighting experience, this is not only leveling to yourselves. No, your equipment gets experience, she has collected enough, it turns a secret additional capacity free! Siggi is an offbeat contemporary to her, finds in a side street. For him, the same applies as for the shop, only from level 4 will be negotiated! If you talk with Siggi from Level 4, he told you that he can produce for you the other equipment included Inge, who stand around with you in Inkopolis! This is to other players that are online, or were. 1. Speak with a Inkling A and looks if you like your equipment! 2. Suppresses X to place an order if that's the case! 3. Seek out the piece of equipment from the you want! 4. From midnight (00:00 clock) Siggi has the required equipment ready and until the end of the day on offer! One surprise has Siggi in store for you if you are level reached 20 to put it briefly, if you're not satisfied with the 2 skills of your equipment Rejoice it to reach level 20! 1. He can not require special equipment manufacture (below)! 2. He can always only accept up to 3 orders! 3. The more stars, the equipment the more expensive it is with him (which beginners a 3-star equipment want to look around the 15,000 does)! 4. The equipment does not always have the same capabilities as the original! Again, for the weapons store the same as for all the shops, at least at level 4! What you meant to come at all to another weapon, you have to get with the normal "dauber" penetrated to Level 4. Have you done that, you do not even expect a wide range of weapons! Your turn thereafter for each level that you ascend, 1-3 weapons free. But there are 2 unlock other opportunities Wafffen, via the story mode and Amiibos! In Story Mode, you'll get from every boss monster, explains how to build a better weapon (but for this, you have to have a certain level)! The Amiibos her on the standard weapon of Amiibo with a cooler design freely, if you have completed all the missions in respective Amiibo! In Gegensatzt to the Equipment stores of weapons-store has a limited supply and increased its daily were not on (this end, Nintendo has however announced DLC for new weapons that you can then probably buy again)! In Octo district you play through the story mode, with a predetermined gear her with enough points (Orange Pearl) can upgrade! This can be found in our complete solution all play through the story levels with a great video tutorial! And as already mentioned, are all 2-star-equipment! So a good reason for beginners to play through the story to have a useful equipment for the online mode for the start! The Amiibo area, is a small part of the city, which looks like a Amiibo - Storage box. There you can read Amiibos to play Story level with special conditions and dust off money or rewards (equipment, minigames or arms) of boss enemies! You cannot reset the Amiibos, since only the "Amiibo-Read" function is used, and the progress is saved at the Amiibo missions in the game! - Inkling Boy (The levels always be played with the paint roller)! - Inkling Girl (The levels always be played with the concentrator)! - Inkling Squid (The Level either played as ink Titan with time limit or with limited ink)! Perhaps Nintendo is us still surprised with an update that Amiibos firearms utilize (eg. Samus or Mega Man), but so far only the above 3 Amiibos are usable! The online lobby is located in the great tower in the city-center, which is the Tokyo Tower modeled. There you can so far in 4 Vs. 4 matches, under standard fight, "area" –fighting and ranking battle, "Mr. Creates" - fighting unsubscribe! For each played match gets her experience and increases after some time in your step on! Besides these every 4 hours to change the 2 arenas for the respective battle mode. So it brings relatively little, to specialize in an arena, if this is for the next 4 hours Not to choose from! Here are your equipment and its effects important that you earn you about the story or you bought in town! Thus there are no unfair advantages, all arenas are ALWAYS built symmetrically or mirrored, so that both teams exactly the same way have to the center of the arena. If you were defeated, do not get panic, you will spawn again after 5 seconds at the start point. It is not possible to change the color of the starting point of the opposing team (he is protected by a force field that you push back)! You can align to the starting point if you're close enough to enemies, who were defeated, for 5-6 seconds off again when they are revived! Here you have within 3 minutes, try to play the end to have more colored by the arena in his own color than the other team. What counts here is the amount of space not KOs! Here you have to within 5 minutes, try a field (which is displayed on the Wii U you-Game Pad) in the Arena Center in their own color, to color and to keep this area in their own color as long as possible. 1. Your meter is at game end, lower than that of the opposing team! For example: Red Vs. Blue (20:25). Then Red Team wins! 2. A knockout victory! Your make it during the game, to bring your counter first to 0, then the game ends immediately with your victory! Here you will get in addition to the experience even rank points, these are important to increase your rank (you start with C and can be up to A + high fighting)! Depending on your rank you have most players with the same rank as a team and as an opponent! That's up now all available modes, but there were still more game-modes of Nintendo confirms yet to appear in the near future! If you equip your character, goes in the equipment menu. There you can choose a weapon and with Y Change to a test / training grounds. 1. Distance and tank-check: There is an area with white markings, here you can see and assess how far you shoot with your gun or injected can. Besides these you can try out how long your ink tank by holding, if you once the tank empty shoots with continuous fire! 2. 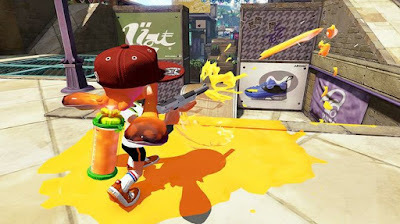 Secondary and special weapons check: here you can test how much ink your secondary weapon R consumed and depending on how long it acts weapon, then you can decide whether you keep them for useful. After that you can if you have colored enough, your special weapon test by pressing the right Control sticks! 3. Battle Damage Check: You can find at the training ground to be shot were waiting on the many test (Octo) - Dummys a small basketball court. Here you can see how much of the individual shots they endure until they explode, but that's not all, there are dummies equipped with the defense capability (as you can see in the screenshot). So you can see the difference in the damage and test new maneuvers! On the training ground are (almost) all equipment and their skills actively (exceptions are skills such as starting time bonus or bonus sprint, basically all the skills that bring something in an online battle situation)! Are you on the premises, you can with - during training, immediately to any change weapon that you have! But if you should even be too crowded field, you can do it easily with the "ink removing" button on the game pad to clean! If you want to test your Auserd special weapon, but the terrain is already colored, you can clean it as described above to your special weapons display to refill. So do not worry that it inconveniently in training and out again definitely need! - Limited or slow movement during "continuous fire"
The strategy behind the dauber and all its variations is easy to medium distance it colors everything a while their colors you piece by piece to the Arena Center. Take but if it is possible to higher lying way around the arena-middle order due to the higher position to have an even bigger hit radius, which simplifies the coloring and doing the enemy! Should you but even dealing with an enemy who lurks at a higher level, is not aimed at the edge of which it is but it, because depending on the dauber your ammunition may fall down on the enemy at a certain height (tests the approximate height previously in training mode). If your opponents are on a grid, so you can do in directly through the grid (but is fast because the same goes for your opponent)! Should you use a dauber for longer distances, you can even if the Arena Center is ingested, also penetrate into the enemy's territory, pays attention to the ink of the opponent and whether perhaps something moves or is shot so the opponents to a corner come intercept! - Very slow movement during a "charged shot"
Here you start in which their "charged shots" with a long ink path toward the center of the Arena shoots. Do not get entangled in 2 fights, but tried to do in advance enemies at bay, you then look for an elevated point at which it takes a little longer to go or to come up (then retain the map in mind, so you can still act before you opponent can do from the back)! If you have found a suitable spot, tried by normal pressing the shot button to color the surface of you in a wide network. Imagine so back that can take you from the bottom Projektile hardly or difficult and then the lookout for enemies who can turn her specifically! In a duel with a paint roller or dauber it does not matter if the first shot is not sitting, when he has done at least slight damage. But you should nevertheless as soon as possible on the enemy off this UMD. In a duel under 2 Snipers usually wins the one who can fast targets, charging and shoot (or with the longer range), so you might have problems going to the training ground and improved your reaction and reflexes to the movement a to meet target and remember not run the her during a "charged shot can! - Flicking while "continuous fire"
The scooter may not shine with a great distance, but can it cover wider areas, which one in particular arenas easily times inking a side street with a pass. Otherwise, do you think the scooter to the Arena Center. In order to attack from above not to be completely defenseless, you can by pressing the shot button, a color charge at the enemy hurl is over you (but does not make this too many times, as it quickly teaches your tank). If it is possible to try in enemy territory, recolor the largest possible area, one or two enemies should appear to you in your ink withdraws and waits until they advance. Then finish them off with a counterattack through your color spin!